Home » Digestive Supplements	» Are Prebiotic Supplements Children Friendly? You might have heard about prebiotic supplements. Children, adults and older people all experience digestive problems at one time or another, with some experiencing more severe forms, while others only suffer from them occasionally. For parents, their main concern will likely be their kids. Are these nutritional supplements safe for kids? Kids also suffer from digestive illnesses caused by an imbalanced digestive system. Some of the more common ones that they suffer from are diarrhea, constipation, acid reflux, lactose intolerance, food sensitivity or allergies and colic. Some of these conditions can be easily managed and they will disappear eventually, while others are more serious or may lead to more serious conditions. Most of these problems are caused by poor diet, with lack of fiber being the most common reason. Not drinking enough fluids, bacterial or viral infections and even ingesting a non-food material or a toxic item may also be the reason behind digestive symptoms shown by kids. Symptoms may also include vomiting, stomach pains and irregular defecation. Whatever symptoms are shown, a doctor should be immediately consulted as conditions like these in kids require special attention. If the problems with digestion encountered by your kids have more to do with lack of fiber in their meals, improving their daily diet by adding more fresh fruits and vegetables will be of great help. Increasing their fluid intake is also a must. However, there are cases when it is really difficult to get kids to eat vegetables or fruits, with most of them preferring “fun” foods like chips, chocolates and junk foods. Some have suggested the use of prebiotics supplement. Children though, are a different matter and it is important to consult doctors first before giving them unfamiliar food or supplements. You can ask your doctors about possible supplements that they can take as these would be easier than making them eat foods that they do not fancy. Going back to prebiotic supplements, most parents’ first question will likely be – are they safe? Before we provide the answer to this question, let us first discuss what prebiotics nutritional supplements are. These supplements contain prebiotics or dietary fibers found in fructan-rich plants, like kiwi fruit, garlic, asparagus, leeks and onions, just to cite a few examples. Prebiotics are food ingredients that are non-digestible. This is actually a good thing since they enter our digestive system with their original structure intact. Primarily, they induce the growth and activity of good bacteria that are naturally found in our stomach. These good bacteria, when working right, prevent bad bacteria from harming the stomach and are therefore significant in maintaining a healthy digestive system. When used as ingredient in a health supplement, they can provide the necessary amount of fiber required by the body to remain healthy. Since kids usually choose their food based on what they like and not necessarily on what is good for them, giving them dietary supplements may be the most effective way to provide them with the nutrients that they may lack by not eating enough vegetables or fruits and other foods rich in fiber. However, giving children dietary supplements should not be done lightly. Again, a consultation with a doctor is necessary. Choosing the right supplement is also a must. You just do not pick a product for your kids just because it says that it promotes digestive health or that it contains prebiotics. You need to make sure that you are getting a good and safe one. One option that parents may want to check out is Kiwi-Klenz from Xtend-Life. This is a prebiotics-rich supplement specifically formulated to promote the health of the digestive system. The product is made from all-natural ingredients, with kiwi fruit being its most prominent material. It is processed using a patented system that preserves the enzymes, prebiotics and phenolics that are part of its make-up. The capsules are also tasteless, so it will not bother your kids. 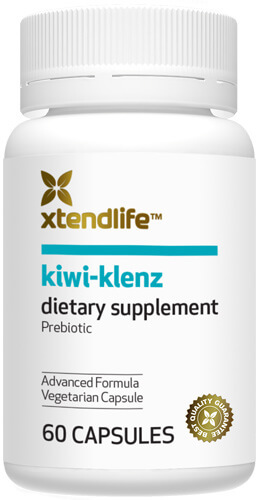 Kiwi-Klenz is an ideal supplement for those looking to keep their digestive system healthy and it is suitable even for kids. When looking for prebiotic supplements, children should also be a consideration and before giving them any type of food or nutritional supplement that they have never tried before, it is always advisable to seek the opinion of a doctor.